Love Taco Bell? Want to enjoy their lighter menu? 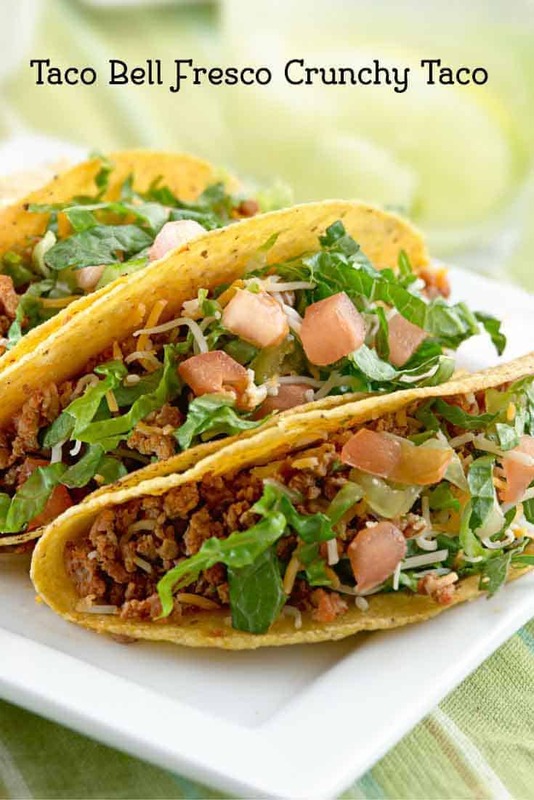 Why not try this delicious copycat recipe for their Fresco Crunchy Taco? I have to confess, Taco Bell is a place for me where I still stop at for lunch or even a late night snack. I have fond memories of Taco Bell in high school, and from college. Taco Bell was a place where you could easily get full on about 3 or 4 dollars. While I don’t eat like I did when I was that young anymore, I still like that place. Sometimes I now order from their Fresco menu, the Taco Bell Fresco Menu is lower in fat, and calories, so I don’t feel so bad when I want to enjoy Mexican food. For the Taco Bell Fresco Crunchy Taco, I use a leaner beef on, and I still use my version of the Taco Bell ground beef. This one we add lettuce, and their pico de gallo, and if you like a tiny sprinkling of cheese. So this recipe is lightened up, by making a few changes. You may even want to top it with my version of the Taco Bell Mild Sauce. One thing is for certain you recreate this flavor at home. You may want to lighten up other Mexican favorites. Easy ways you can do that is to leave out the cheese as much as possible; I sometimes know you want a shredded cheese. Choose leaner cuts of meat to recreate your favorite recipes. 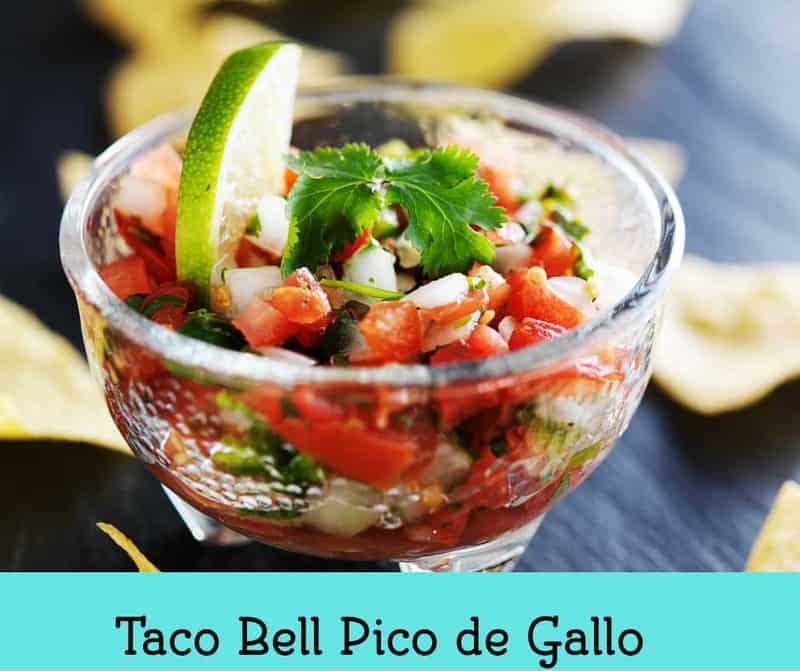 Pass up the sour cream and guacamole, but you can load up on the pico de gallo and lettuce. These few simple tips can help make your Mexican food a little lighter. Enjoy these lighter tacos from Taco Bell. Beef FillingMix together all the ingredients except the meat. Stir the spice mix well to make sure that all spices have been blended well.Crumble the ground beef into a large skillet (preferably nonstick) and brown, stirring well. Remove from the heat. Dump the meat into a strainer in the sink, rinse with hot water, and drain off the water and grease from the beef. Return the beef to the pan. Stir in the spice mix and 3/4 to 1 cup water. Simmer on medium-low heat for 20 minutes, until most of the moisture has cooked away. Remove from heat before the meat is completely dry.TacosIf you like, you can refresh the taco shells in the oven at 350 degrees F for 7 to 10 minutes. Top tacos with plenty of fresh lettuce and pico de gallo. It is a very fine corn meal. You could leave it out. Hi Stephanie. I love your website and thank you for all that you do to keep it up and running. May favorite is by far is the crunchy taco. I always get a 12 pack!!! I sure miss their Diablo Sauce they had for a short time. That stuff was addicting. Now I’m having withdrawals and have to substitute Fire Sauce. How about a recipe for Diablo Sauce? Please!!! What is your favorite menu item at Taco Bell?